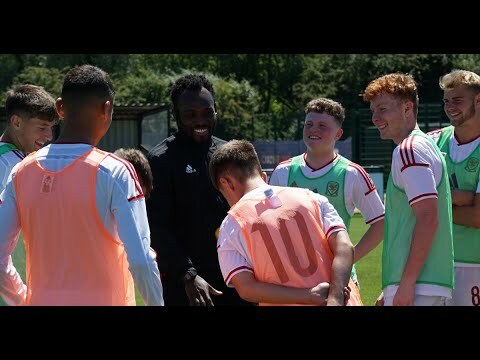 Chelsea and Ghana legend Michael Essien joined us on our 2018 FAW UEFA B Licence residential course. Congratulations on completing our UEFA B Licence Residential course. How was it? It was a long week, full of information, but I was in among a group of fantastic guys. We had fun but we worked hard so it was a really good experience. This was your first experience of coaching, how important was your mentor? Gareth Owen was my mentor and he was brilliant because he understood that everything was new to me. He knows that it’s easy to be player sometimes but very difficult to be a coach so he gave me a lot of information about thinking like a coach. Any time I needed him, he was there. The group came together from a range of different backgrounds. How did you all bond? In my first session, it was obvious I didn’t know what to do but they all came together and guided me through it. That really built my confidence. Now I know what I’m doing, so I’m very grateful to the other candidates. What are your ambitions in coaching? I don’t know yet because I’m still active as a player. I want to think about what I’m going to do next before I stop. Doing this course was a big step for me and it will be nice to have the badge before I know what’s going to happen next. How different is being a coach to being a player? As a coach, you have to do a lot of talking. You have to tell the players what to do, where they have to run, and a load of other things. When I was a player I would just listen and do what the coaches wanted but coming here and seeing what being a coach is like has been great. Now I’m looking forward to doing it. You’ve played under some great managers. Does any particular one stand-out? I would always say Jose Mourinho, because of the relationship I had with him. He was the one who brought me to the Premier League and I learned so much from him. But Carlo Ancellotti and Gus Hiddink were amazing too. I try to remember all the bits and pieces that they told me and to put it out there in my sessions. You’ve played at the top level. As a coach you might have to get messages across to players not as talented as you. Is that something you’re prepared for? That’s why I came here. To learn. And I think I progressed every day. It’s my first experience of coaching but having played for different managers who have shown me different ways of getting their messages across, hopefully it’s something I can learn. If one of your team mates asked you about our FAW UEFA B Licence Residential course, would you recommend it to them? Of course, I would recommend it to them because, before I came, I had no idea what it would be like. I had zero coaching experience but in one week I learned so much. So I would always recommend coming to Wales because everybody is very nice and really helpful, that made it a great experience.